Smoke Testing is a quick easy and inexpensive way to locate direct sources of inflow in your wastewater collections system. Smoke blowers are made of lightweight cast aluminum and can be used with traditional smoke bombs or liquid smoke. Our team at PrimeLine Products, Inc. understands how important it is for your pipe business to offer the most effective and reliable detection services in the industry. We are a company comprised of expert professional experts who offer the most high-quality and state-of-the-art equipment possible to ensure you build your company’s brand while providing customers with services they are satisfied with. Our equipment is extremely durable, which allows you and your expert technicians to complete your day to day operations with speed and precision. Smoke testing equipment is a great investment for your pipe company. Smoke testing is an easy, quick, and inexpensive way to locate direct sources of inflow in your wastewater collection systems. 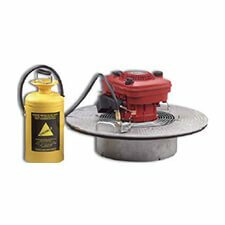 The smoke testing equipment we provide you with is a reliable way test sewer and drain systems by blowing large volumes of smoke and air into sewer lines. The smoke will travel through the pipe with speed to show areas where stormwater and groundwater can enter into the sanitary sewer system as well as finding places where pipes will release or spill fluid. The smoke testing process involves smoke traveling through your clients’ systems identifying the problems in all connected areas. Smoke testing can be performed on main lines as well as lateral line systems. An essential piece of equipment that allows for successful smoke testing are blowers. Blowers allow for smoke to be moved through the system using static pressure. Smoke blowers are made of lightweight cast aluminum and can be used with traditional smoke bombs or smoke liquid. Smoke bombs use a smoke candle and fresh air, creating a chemical reaction that is excellent for finding leaks. Smoke fluid is injected into the blower where the heater chamber is to create smoke. The heating chamber allows for consistent slow to be blown throughout the whole smoke testing process. When make the choice to invest in smoke testing equipment, it is important to understand how the service will best assist your technicians in solving pipe problems as well as providing quality services to your customers. The most immediate benefit of smoke testing is that helps your company to reduce chance of overflow or other serious problems that may occur because of faulty pipes. In addition, smoke testing equipment and services allow for your team to possibly find sections of a pipe system that were thought to be independent or not exist at all. Offering viable testing services is also important because they can be useful in situations where your customers pipes are not completely sealed, for example, if they have ventilated sewer system. All of our products at PrimeLine Products, Inc. are affordably priced and built to last. If you are looking to make a lasting investment in your company and the equipment you use, contact our team of professionals today to assist you in choosing the best products for your company.